How To Get There: Turn south off county Road 390 at Rockdale/Silverdale (not marked, but buildings are visible from the road) and follow the 4 wheel drive road 2.7 miles to the Pear Lake trailhead. The hike to the lake is very short from the parking area. Difficulty: Spring runoff may cause creek crossing to be hazardous. Four wheel drive with high clearance is recommended. 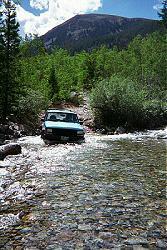 After crossing the creek, high clearance but reasonably easy 4 wheel drive access takes you to a parking area for an easy 10 minute hike to the old fish hatchery. History of Clohsey Lake and area: A number of silver and copper ore discoveries were made in this area, although none ever amounted to any major production. 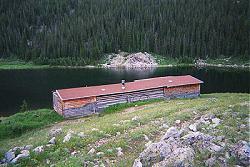 Perhaps the area, although laced with signs of small prospector's activities, is best known for the 1885 fish hatchery building, part of which remains today overlooking Clohesy Lake.